2017 looks busy for cleantech – read more about the landscape as we turn our gaze forward. We wrote about cleantech trends in 2016 and how a multiplying global population, urbanization and demands for sustainable solutions are drawing investments for cleantech. Now we want to help investors understand what will happen in 2017. We reached out to analysts, CEOs and experts for their thoughts on the year ahead. This refers to investing that can be quantified in terms of social and environmental benefits, alongside a financial return. Alterra Power (TSX:AXY) is an alternative energy operator, picked by Rick Rule, CEO of Sprott US Holdings, as a positive investing prospect for 2017. They are a good example of impact investing as Rule says a free cash flow will likely begin next year, now that Alterra has established itself in the marketplace. Schumann regards water as the single largest societal and ecological investment opportunity in the world. Socially responsible investing (SRI) places an emphasis on environmental, social and governance (ESG) issues. The CFA Institute credits changing demographics and “the economic rise of pro-sustainability millennials” as the driving force behind increasingly socially aware investing. Water has no substitute, making it incredibly valuable. Schumann says that the current market size of water is at $500 billion and could be “$1 trillion by 2020”. SkyH2O is a water supply company looking for investors to finance its atmospheric water generation (AWG) project that provides fresh potable water. Schumann states that investing in this will “provide long-term capital appreciation”. The traditionally responsible and risk-averse investment community has recently been reluctant to commit to cleantech, with climate deniers contributing to its confused narrative and wobbly financial markets stalling investments. Many cleantech companies are startups, facing the constant challenge to perform, in order to achieve their fundraising targets, be bought or go public. If angel investing at an early stage, understandably investors look for attractive exits. Businesses who look to be purchased keep an eye on M&A opportunities or may IPO and continue to grow as stand-alone entities. Safe-h2o is a water quality company based in San Francisco and was named by Schumann as one to watch in 2017. They rely on seed funding and their exit strategy is the former, to be acquired by a big diversified water company, like Danaher (NYSE:DHR), a leader in treatment systems, or American Water (NYSE:AWK). Safety is an issue. Samsung’s (OTCMKTS:SSNLF) Note 7 phones caught fire due to their lithium-ion batteries overheating, news which could change engineering and certification practices. These batteries are used in electric cars too, where fires would be even more dangerous. In light of this, Cosmin Laslau, senior analyst at Lux Research, poses a question for the upcoming year. Laslau wonders whether developers will find new materials and software that prioritize safety, across the board in electronics. He asks how “do we charge all these future EVs in a clean way”, as well as a safe way? China is a hotspot for cleantech as it faces huge water security challenges and needs to act and invest accordingly. According to a Forbes article, 80 percent of China’s rivers are too toxic for fish, let alone humans. By 2020, the region will see the largest reduction in emissions and the greatest increase in renewable energy capacity in the world. 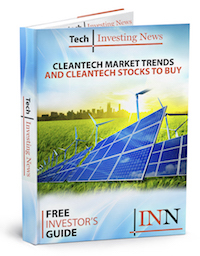 For the investor looking to their financial future, cleantech is the key to unlocking potential revenues. Schumann’s emphasis on time as a key factor shows that rewards are to be reaped further down the road. The upside is that stakeholders can make an environmental impact while waiting to experience monetary gains.